The Cruze is impressive. With such a smooth ride and quiet interior, it feels like a much larger car, and reliability has been solid right out of the gate. Consumer Reports, the world’s largest and most trusted independent, nonprofit consumer organization, today announced that seven new vehicles made their 2017 Annual Top Picks list—the Toyota Yaris iA, Chevrolet Cruze, Kia Optima, Toyota Highlander, Audi Q7, Toyota Prius and Honda Ridgeline—in each of their respective categories. The findings were unveiled at the National Press Club, before the Washington Automotive Press Association. The redesigned Cruze earned top marks in the highly-competitive Compact Car category. The Cruze’s Overall Score bested the Honda Civic and Toyota Corolla‒two historically entrenched stalwarts. With the Impala carrying over its top score for Large Sedan from 2016, the Cruze’s addition marks the first time Chevrolet has held two of the Top Pick sedans since CR began naming them in 1992. “The Cruze is impressive. With such a smooth ride and quiet interior, it feels like a much larger car, and reliability has been solid right out of the gate,” said Jake Fisher, Consumer Reports’ director of automotive testing. Another impressive redesign, the Honda Ridgeline debuted as CR’s Top Pick for Compact Pickup Truck. The Ridgeline demonstrates that trucks can be both refined and versatile. CR’s engineers found the Ridgeline drives more akin to a sedan than its roughneck rivals. It also handles far better than any compact or full-sized pickup, and achieves a 20-mpg overall, shaming all non-diesel trucks for fuel economy. In order to be a Consumer Reports Top Pick, a model has to have an exemplary Overall Score in its vehicle category. This single number consolidates the findings from four key pillars: road-test performance, predicted reliability, owner satisfaction, and safety. A car that bests the competition by these measures is truly extraordinary. Consumer Reports’ 2017 Top Picks list, Car Brand Report Card and more are available in the Annual Auto Issue, and online at http://www.ConsumerReports.org/april. SUBCOMPACT CAR: Toyota Yaris iA ($17,570) Developed by Mazda, launched by Scion, and now marketed as a Toyota, the Yaris iA proves that subcompact cars can delight. A different model from the Toyota Yaris hatchback, the frisky iA sedan stands out in a segment filled with insubstantial models. COMPACT HYBRID: Toyota Prius ($27,323) The car that pioneered the hybrid movement and defined fuel efficiency for four model generations still stands tall as an innovative green machine. Its fuel economy in CR’s test was a staggering 52-mpg overall—the highest the organization has ever recorded in a car that doesn’t plug in. The Prius also touts excellent reliability, a remarkable accomplishment given the inherent complexity of its hybrid powertrain. LUXURY SUV: Audi Q7 ($68,695) The seven-passenger Q7 is the highest-rated SUV CR has recently tested. Sumptuous and pampering, it feels more like a luxury sedan than an SUV. Despite its generous size, the Q7 has genuine agility, with road-hugging chops, a settled ride, and excellent brakes. SPORTS CAR: Mazda MX-5 Miata ($29,905) For the second straight year, the MX-5 Miata retains its spot for CR’s Top Pick. Its alchemical formula has been honed since 1990, with the core ingredients consistently being a pliant four-cylinder engine, rear-wheel drive, sharp handling, and light weight. SMALL SUV: Subaru Forester ($27,145) The Subaru Forester sets the standard for small SUVs, combining relatively roomy packaging, fuel efficiency, solid reliability, and easy access. Large windows and a boxy shape maximize room for passengers and gear in sharp contrast to style trends exhibited by competitors that compromise practicality. Performance is decent from the standard 2.5-liter four-cylinder engine, and fuel economy is excellent at 26 mpg overall. MIDSIZED SUV: Toyota Highlander ($41,169). In this competitive segment, midsized SUVs have to do it all well, and none do it better than the Toyota Highlander. Throw in good performance, fuel economy, and long-term reliability, and Highlander’s appeal is clear. The 2017 update sees 25 more horsepower for the V6 engine, two additional gears and advanced safety equipment made standard. In other words, this gem of an SUV has all the right moves. COMPACT PICKUP TRUCK: Honda Ridgeline ($36,480) Innovation abounds in this suburbia-targeted pickup, proving that trucks can be both refined and versatile. The Ridgeline isn’t up for big-time towing or off-road adventures, but this smartly designed truck more than makes up for that with other benefits. The lockable in-bed trunk and dual-mode tailgate add to its flexibility. Many truck buyers dream of a large, rugged behemoth, but the Ridgeline excels at the factors most noncommercial drivers with weekend warrior aspirations will appreciate. COMPACT CAR: Chevrolet Cruze ($23,145) This hushed, smooth-riding sedan is roomy enough to be a budget-friendly alternative to a midsized car. The polished 153-hp turbocharged four-cylinder engine is lively yet frugal. It achieved a good 30-mpg overall—and an impressive 47-mpg on the highway. MIDSIZED SEDAN: Kia Optima ($25,860) This Kia Optima rocks the midsized sedan segment as a smart alternative to the me-too mainstream. It checks all of the right boxes for family-sedan buyers, with responsive handling, a steady ride and pleasant powertrain, short stopping distances, easy-to-use controls, and a roomy backseat. The Optima is a vehicle that delivers all of these virtues in a stylish, value-laden package that’s filled with features usually found on pricier cars. LARGE SEDAN: Chevrolet Impala ($39,110) The Chevrolet Impala continues to reign as the leading large sedan for its third consecutive year. With enough cabin space to fit five comfortably, the roomy, supportive seats put the driver in perfect position to access the intuitive controls. Sedan shoppers browsing upmarket choices would be wise to give this smart, competitively priced alternative serious consideration. 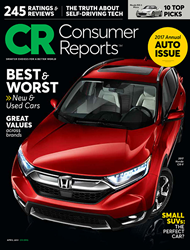 Complete details on Consumer Reports’ Top Picks for 2017, Car Brand Report Card, Best and Worst Lists and other key findings are available in the Annual Auto Issue of Consumer Reports on newsstands March 7th or visit Consumer Reports’ 2017 Autos Spotlight page http://www.ConsumerReports.org/april. Consumer Reports’ testing procedures are the most comprehensive of any U.S. publication or Web site. More than 50 individual tests are performed on every vehicle, including evaluations of braking, handling, comfort, convenience, safety, and fuel economy. Roughly 6,000 miles of general driving and evaluations are racked up on each test car during the testing process. CR buys all its test cars anonymously from dealers. Other reviewers base their evaluations on press cars that are hand-picked by the automakers. © 2017 Consumer Reports. The material above is intended for legitimate news entities only; it may not be used for advertising or promotional purposes. Consumer Reports® is an expert, independent nonprofit organization whose mission is to work for a fair, just, and safe marketplace for all consumers and to empower consumers to protect themselves. We accept no advertising and pay for all the products we test. We are not beholden to any commercial interest. Our income is derived from the sale of Consumer Reports®, ConsumerReports.org® and our other publications and information products, services, fees, and noncommercial contributions and grants. Our Ratings and reports are intended solely for the use of our readers. Neither the Ratings nor the reports may be used in advertising or for any other commercial purpose without our permission. Consumer Reports will take all steps open to it to prevent commercial use of its materials, its name, or the name of Consumer Reports®.